You can read Mike Newman’s preview of all 5 sectional races on DyeStatIL, including the Hinsdale Central Sectional that DGS will be competing in tomorrow! The DGS girls cross country team will compete in the Hinsdale Central IHSA Sectional meet at Katherine Legge Memorial Park on Saturday, Oct. 31. While the rankings give us a good idea who to look out for, the only thing that matters are the actual races results themselves. During last week’s three Regional meets, rankings were irrelevant as several upsets took place. At the Lyons Township Regional, Hinsdale Central upset the host school to win the title. Hinsdale Central was led by the 1st place finish of Reilly Revord (So) and bolstered by the return of Annie Zaher (Sr) to give them a very formidable 1-2 punch. Lyons Township has a mix of freshmen and seniors, led by Sara Barcelon (Fr) to give them a solid pack up near the front. Lockport also used a pack-running formula to secure the team victory at the Plainfield South Regional. Morgan Bollinger (Jr) fronts a very tight group of runners that are hard to break up. Both Downers Grove South and Benet Academy have front-runners that lead their teams to state qualifying hopes. 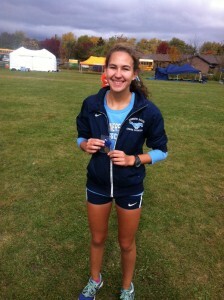 Katie Stapleton (Jr) of DGS won the Plainfield South Regional meet with Clare McCabe (Sr) of Benet right on her heels. The two teams have each beaten each other once this season with Benet coming out on top at the Regional meet. Both DGS and Benet are positioned to take the final two qualifying spots if the rankings follow form. But there are at least three other teams that are not to be overlooked heading into Saturday’s meet. Sandburg, led by Erica Cerva (Jr), won their own Regional meet last week and continues to improve. Downers Grove North finished only 9pts behind DGS at the Plainfield South Regional behind their top runner, Emma Moravac (Jr), and will certainly look to close the gap. Plainfield South has a front-runner in Greta Carlberg (Jr) as they will look to push their way into the top 5 picture. When the dust settles at 11:30a on Saturday, the five best teams will have punched their ticket to Peoria and the IHSA State Meet! Author Coach PlunkettPosted on October 28, 2015 Categories Cross CountryLeave a comment on IHSA Sectional on Saturday! The DGS girls cross country team placed 3rd out of 9 teams at the Plainfield South IHSA Regional to advance to the Sectional race. Katie Stapleton (Jr) led the way winning the individual championship for the 2nd week in a row. Katie battled Clare McCabe from Benet Academy the entire race and managed to pull away from her in the last ½ mile to win by 5 seconds in 18:08. The course was not ideal for fast times as it was wet and slick from the rain and included lots of twists and turns in the woods, which made Katie’s time that much more impressive. Becky Versaskas (Fr) finished strong to place 8th overall in 18:40. The other DGS finishers were Gillian Thomas (So) in 22nd, Emily Qualizza (Sr) in 23rd, Melissa Weidner (Fr) in 24th, Michaela Hackbarth (Sr) in 26th, and Jill Boyle (Sr) in 27th. The Mustangs will compete next Saturday at KLM Park in Hinsdale at the IHSA Sectional meet. Author Coach PlunkettPosted on October 25, 2015 Categories Cross CountryLeave a comment on Katie Stapleton wins Regional! Check out the preview for the IHSA Regional meet on DyeStatIL. Downers Grove South will be running in the Plainfield South regional. There will be 9 teams competing (Bolingbrook, Downers North, Downers South, Benet, Lockport, Plainfield Central, Plainfield East, Plainfield South and Romeoville). The top 6 teams and the top 5 individuals not on one of the top 6 teams will qualify on to the IHSA Sectional hosted by Hinsdale Central. Over 400 great pictures of yesterday’s conference meet can be found HERE. Thanks to Laura Duffy for recording all of these memories! Author Coach PlunkettPosted on October 18, 2015 Categories Cross CountryLeave a comment on Conference Pictures! DGS sweeps WSC Gold Conference! Downers Grove South hosted the WSC Gold Division Conference Championship meet at O’Brien Park on Saturday. All 4 levels took home 1st place team honors and DGS had the individual winner in all 4 of the races. This is the third year in a row that DGS has swept both team and individual titles on every level. The freshmen started off the day with a team win led by a 1-2 finish from Allison Calek (Fr) and Amanda Annese (Fr). Allison ran 19:58 in the 3-mile race to win. The Mustangs scored 25 pts to runner-up Morton’s 41. The girls in the sophomore race continued the streak and upped the ante with a perfect score of 15 pts, ahead of 2nd place Morton (60 pts). 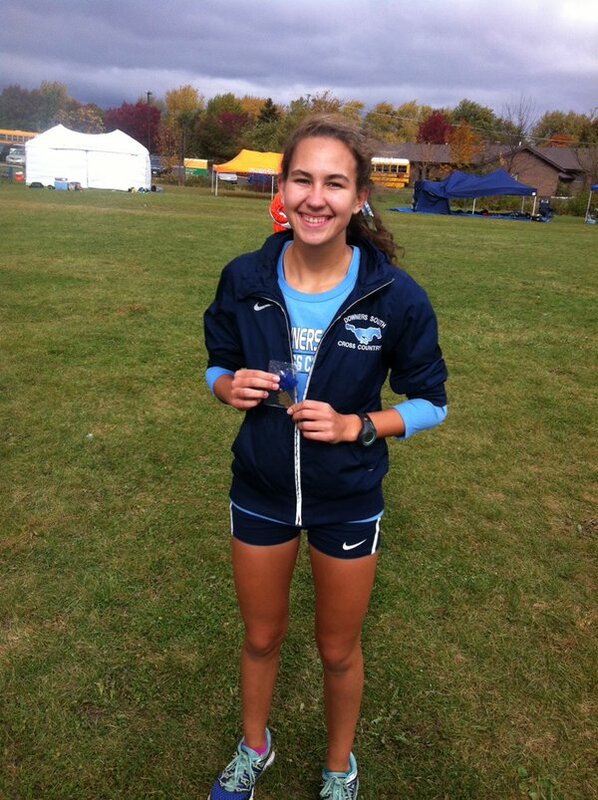 Freshman Melissa Weidner ran a great 18:49 time to win the race and lead DGS to a 1-2-3-4-5-6 finish. The 2nd through 6th place girls were Natalie Olsen (So), Alyssa Taglia (So), Riya Bhasin (So) and Carlirose Smid (So). The DGS varsity won their 17th consecutive conference title by scoring 16 pts to runner up Leyden’s 75. Katie Stapleton (Jr) led the Mustangs to a 1-2-3-4 varsity finish by running a great 3-mile time of 17:56. She was followed closely behind by Becky Versaskas (Fr), Michaela Hackbarth (Sr), and Gillian Thomas (So). Along with those three girls, Jill Boyle (Sr), Emily Qualizza (Sr), and Olivia Duax (Fr) earned all-conference honors as the Mustangs placed 7 girls among the top 9 in the race. The JV team finished the day off with the final victory, another perfect score of 15, and a 1-2-3-4-5-6 finish by Maggie Seitz (Sr), Kara Petersen (Jr), Megan Albers (Jr), Allie Cheevers (Sr), Lizbeth Alcantara (Sr), and Megan Wicklein (Sr). Maggie traversed the 3-mile course in 19:28 to win the race. Amazingly, 33 out of the 48 DGS runners that competed earned individual conference awards. All 48 runners earned team conference championships! You can access full meet results at kompusport.com. Individual results can be found HERE. Downers Grove South begins the post season next Saturday at the IHSA Regional hosted by Plainfield South. Author Coach PlunkettPosted on October 18, 2015 Categories Cross CountryLeave a comment on DGS sweeps WSC Gold Conference! Check out the current O’Brien Park course all-time lists. 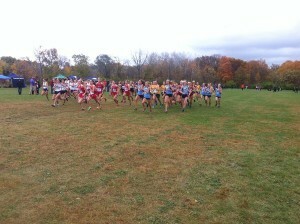 They are compiled from all of the 3-mile girls races that have taken place at O’Brien Park. The records are divided by Varsity races, JV races, and Frosh/Soph races categories. We expect to add a lot of names to those lists at Saturday’s WSC Gold Conference Meet! Check out the updated Pictures and Video page. The Mustangs are the clear favorites on Saturday to win their 17th consecutive conference title and their 30th in the last 35 years. Last week, Downers South completed an undefeated conference dual meet season and notched their 102nd consecutive victory. The streak began in 1999. DGS is currently ranked #14 in the state according to DyeStatIL.